Welcome to Turbulence Training Day 23. Home fitness workouts that'll burn fat and sculpt your body in 4 weeks. 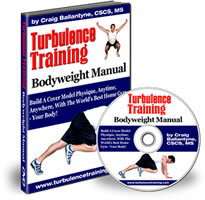 This is day 23 of Turbulence Training's Buff Dudes and Hot Chicks fat burning workout. "Hello and welcome, I'm Asad from Better4Fitness.com and today's Day 23 of the Buff Dudes and Hot Chicks workout. Today's a rest day so I've been walking around the park for about 45 minutes now. I've got a slight niggle in my right knee, so I'm keeping an eye on that. It's only very slightly painful but these things can develop. It's been fine whilst walking so it's probably not anything, but I'll see how it goes tomorrow in the workout. Other than that, everything's all good and I'm gonna carry on enjoying the scenery here. I'll see you tomorrow, take care."